If your dreams of an idyllic honeymoon involves laid-back luxury, breathtaking beaches and non-stop balmy temperatures, the Seychelles will not disappoint. My first visit was to involve a three-night stay on Mahé, the largest of the 43 inner islands and home to Seychelles International Airport, based in Victoria, its capital town. 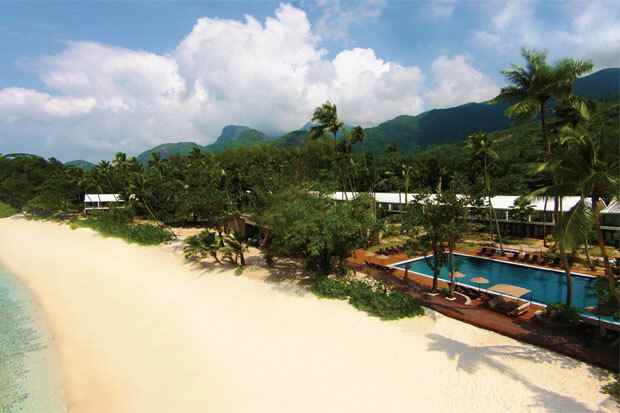 After a 30-minute drive and the first glimpse of lush undergrowth deep with palms, we arrived at the new-look Avani Seychelles Barbarons Resort & Spa (formerly Le Méridien), where all thoughts of travel weariness or my suitcase still languishing at Dubai International Airport vanished instantly. (It was delivered as promised at breakfast time the next morning. Phew!) 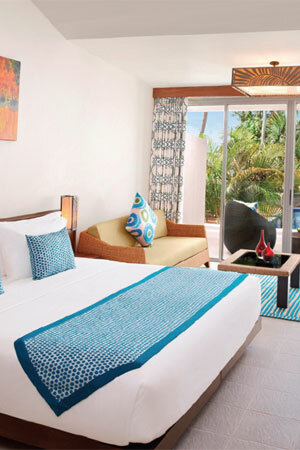 The little touches that make the Avani Seychelles resort stand out were evident from the word go. I was offered a cooling hand towel in the hotel taxi from the airport, an ice lolly on stepping out into the 35 degree heat and the warmest of welcomes from the smiling staff who swiftly escorted me through the luxurious beachside grounds to my room. It doesn't get much more romantic than this. Throwing back the curtains revealed magical views of the palm-fringed Barbarons Beach and I could hear the waves as they lapped the shore a few yards away. It was to become the lulling soundtrack to my stay. The hotel re-opened in March this year after a major interior transformation. It now has a modern, cool and airy ambience that's been brought delicately to life through artistic decorative touches and stunning lighting. Nothing's overdone – it merely makes the most of the breathtaking natural beauty outside. One step into the lobby and a huge picture window gives you the first sight of the incredible sea view. You can have breakfast and dinner in the Elements restaurant, looking out on to the sweep of the resort's quiet, private bay. Or take a coffee to the outside deck and sit in one of the '60s-style hanging basket chairs that sway gently in the breeze while gazing out across the Indian Ocean. Here, I defy anyone not to feel at peace with the world. 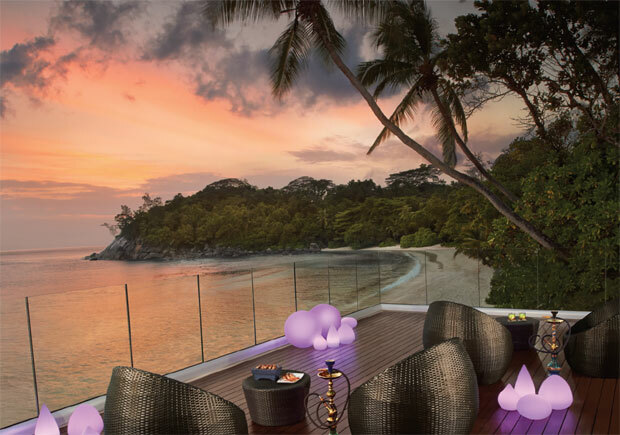 And as the sun sets, the dreamy Gravity Shisha Terrace comes into its own – a raised open decked bar area with seductive glowing lamps, flaming torches and slouchy bean bags – it's the ultimate romantic chill-out spot. This has honeymoon couples emblazoned all over it. Mahé is home to around 72,200 people – that's almost 90 percent of the total population of the Seychelles and a mix of descendants from Africa, India, China and Europe. It's this blend of cultures that gives the islands its individual cuisine – most famously Creole cooking. This is a fusion taking in the subtleties of French cooking, the exotic tastes of Indian dishes and the flavours of the orient. 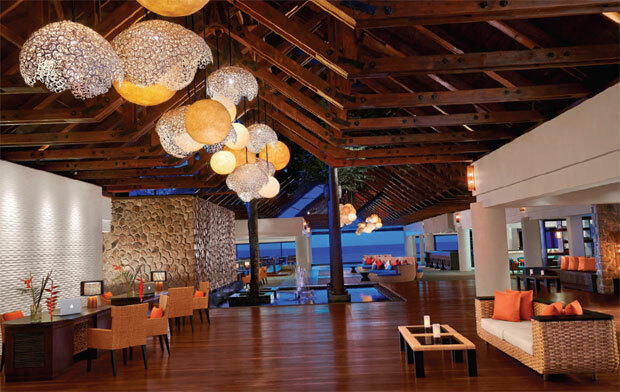 You're spoilt for mouth-watering choices at the hotel with tantalising themed buffets each evening in Elements, or a creative Pan Asian dinner menu in the Tamarind, where you'll be served on the deck or alongside the sandy beach. I had the pleasure of dining al fresco here at the ocean's edge with dreamy glow-jars hanging from the trees. The menu makes the most of freshly caught fish coated in tongue-tingling sauces, crushed chillies and garlic. Curries are often prepared with coconut milk and salads enlivened with tart papaya. A holiday wouldn't be a holiday without sampling the odd cocktail or two and it's no wonder why a Mai Tai has never tasted so good when you realise that Mahé is home to the Takamaka Bay distillery – producers of five blends of rum including an eight-year-old oak-aged variety. You could easily spend the whole trip enjoying the tranquillity of this resort – its white sandy beach, making taxing decisions like whether to swim in the warm seas or take a refreshing dip in the 25-metre outdoor pool. Oh yes, and then there's the spa and wellness centre with a menu of heavenly treatments to re-energise, calm, detox or just plain pamper the most stressed of souls. But having travelled so far it would be crazy not to explore and as you can drive around Mahé in a couple of hours and easily island-hop by ferry to the neighbouring islands, there's really no excuse. I took a 45-minute ferry to Praslin, then a quick 15-minute catamaran to La Digue. Arriving at a quaint jetty it was obvious that the most popular mode of transport on the dirt track roads were bicycles and ox carts. Our island guide took me to the near deserted Anse la Source d'Argent, one of the island's most famous beaches. It was easy to see why – all talcum powder soft sand and that oh-so warm turquoise sea to run into. Back on Praslin and it was the breathtaking Anse Lazio beach that next brought the 'oohs' and 'aahs', with dramatic waves crashing against the hot, deserted sand. It's impossible to visit Praslin without taking in the island's Vallée de Mai, a World Heritage site and home to the protected coco de mer palm which produces the largest nut in the world. The palm is unique to Praslin taking a male and a female variety to produce the coco de mer – the actual nut which looks like a massive double coconut and is as synonymous with the Seychelles as the thistle is to Scotland. It decorates everything from jewellery and pottery to glassware and t-shirts. My time on the island couldn't have been better timed as on the last morning, I took in the exotic, boisterous delights of the Seychelles International Carnival as over-the-top floats paraded their bright finery down the high street in Victoria. It made the perfect end to a perfect stay. 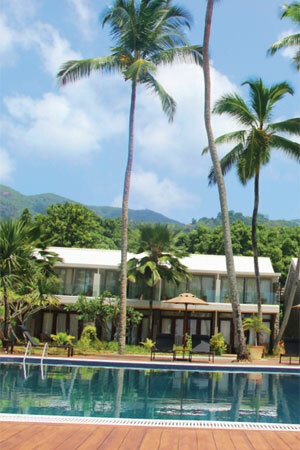 The Avani Barbarons Seychelles Resort and Spa is a stunning spot for newlyweds to relax and unwind. I predict you'll leave feeling even more loved-up with each other and with life in general. Visit Victoria Market for souvenirs from the arts and crafts stalls or stock up on fresh fruits, vegetables and impressive bundles of exotic spices. Sample the delights of the Takamaka Rum distillery and learn how it's lovingly made. Island hop by ferry to Praslin, then La Digue and hire a bike to get round under your own steam. Choose from the numerous trips on offer, including glass bottom boat tours and watch the reef below come alive. Sample authentic Creole cooking in the old colonial-style Marie Antoinette restaurant. While in Praslin, try the Pirogue Restaurant for a shared platter feast. You must try a Gin Garden cocktail at the Avani Seychelles – a visual delight of flora in a long glass with, as you'd guess, a heavy kick of gin.